Known as ''Mr. Tungsten'' in the fusion world, Dr. Rudolf Neu is currently in charge of EFDA's ITER Physics Department . In terms of the number of individuals devoting their time and energy to the realization of ITER, there are of course the employees and contractors of the ITER Organization, currently estimated at 900 people. But this nucleus is surrounded by concentric circles of support without which the project couldn't succeed: the ITER Members; the ITER Council and its advisory bodies; the Domestic Agency teams and their manufacturing partners; and finally fusion associations all over the world. 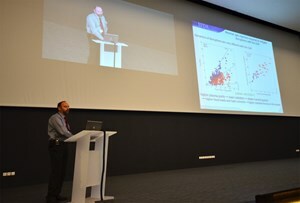 A representative of this last category visited ITER last week as a guest lecturer for the Inside ITER seminar series. Dr. Rudolf Neu from the European Fusion Development Agreement (EFDA) is known as "Mr. Tungsten" in the fusion world. Closely involved with the ASDEX wall upgrade and the JET ITER-like wall, Mr. Neu is currently in charge of EFDA's ITER Physics Department where he coordinates the research program in preparation for ITER's experimentation phase. "EFDA activities are strongly aligned with ITER needs," said Dr. Neu. "Our fusion associations pool resources and share results ... results which are then extrapolated for ITER." Thirty fusion associations are part of the EFDA family, with responsibility for 14 fusion experiments that are currently operating or under construction. Among the exciting projects going on in Europe is JET's ITER-like wall experiment: "This is an experiment that uses the ITER material mix for the first time in a tokamak. We have already had manifold unexpected results from this experiment that we hope will give us new physics insights. This is truly an important experiment for ITER." Dr. Neu also updated the audience on the Fusion Roadmap which draws out the step-by-step aims of Europe's fusion program, with the final goal of fusion electricity by 2050. "The European Fusion Roadmap sees ITER as the key facility for the development of fusion energy." The benefit is mutual, according to lTER Director-General Osamu Motojima: "The European Union's high-level domestic program in fusion is very important for the ITER project. Having such support is very encouraging for us all."